Thank you to artist extraordinaire Leslie for getting us to Detweiler! Can't believe I got to see you twice (if briefly) this year already. Here's hoping for 3! Bart and I hiked north to Detweiler Jct today which is where the GET splits into 2 routes. 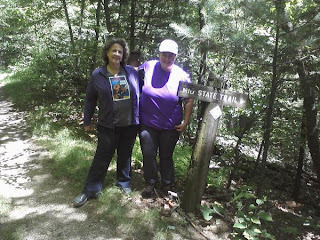 Then we backtracked southbound on the Mid State Trail. The sun is setting from infamous Tussey Mountain and we are ready for bed. Guess I better go set up the tent.